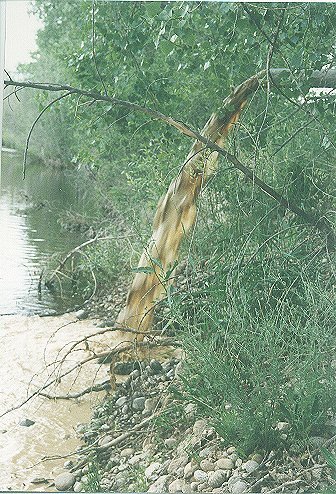 UPDATE: The Colorado Water Quality Control Division investigated the discharge by Golden Gravel Company (now Aggregate, Inc.), via a site inspection by Mr. Tom Boyce on February 17, 1999 and the company complied with all corrective action required by the Division. 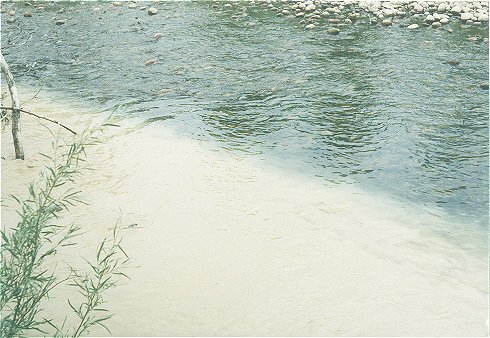 The following photographs show water pollution by Golden's Mining Corporation. The Watchdogs first saw this in the summer of 1998, and it continues into 1999. The Golden's gravel mining site in Hygiene seems to regularly dump whatever this is, into the St. Vrain river. The Watchdogs have documented over 30 types of birds and ducks, including King Fishers, that habitat or migrate through this area. The King Fishers (at least 3), dive for fish particularly in the St. Vrain. This pollution stretches for at least 2 miles, past Airport road. 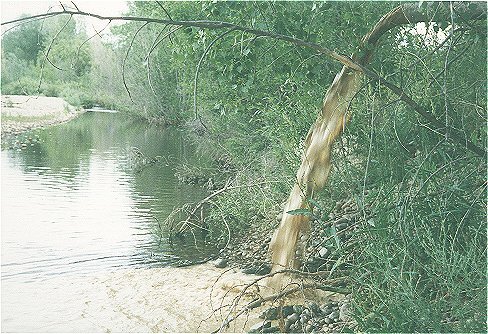 Please email or write the Watchdogs if you see any similiar pollution along the St. Vrain River. Photographs also help.